Servertelpas E-12-PKEA | KONDICIONIERI PANASONIC | KONDICIONIERIS PANASONIC | "SIA RIKON AC"
2016. gada profesioālais servertelpu kondicionieris ! Labākie tehniskie dati nazarē pie -20C ! Paredzēts mazas jaudas servertelpām ar siltuma jaudu 3,5 kW. Paredzēts dzesēt servertelpas bez āra tepmeratūras ierobežojuma. SEER = 6,7 , energoefektivitates klase A++ ! PAW-SERVER-PKEA (opcija)-iespējams saslēgt divus kondicionierus grupā. Profesionālais kondicionieris paredzēts nepartrauktai izmantošanai servertelpās 24 stundas diennaktī un 365 dienas gadā. Panasonic has developed a complete range of solutions for server rooms which efficiently protect your servers, keeping them at an appropriate temperature even when the outdoor temperature is below -22°C. PKEA - Labākie tehniskie dati nozarē pie -20C !!! 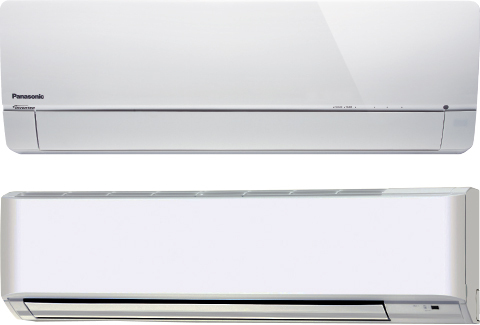 On 24/7 operation, the performance of the air conditioning is a key factor. When the efficiency is high, the return on investment of such units is quickly reached. DC2P Panasonic original compressor, with high efficiency and reliability. 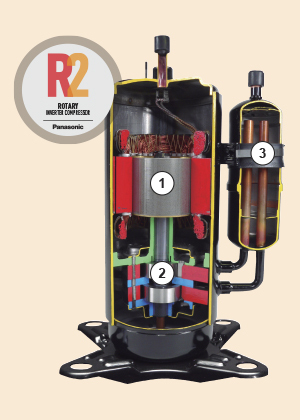 Why is the Panasonic R2 Rotary Compressor so efficient? 1. High Efficiency Motor The premium silicon steel motor meets industry efficiency requirements. 2. Improved Lubrication of High Volume Oil Pump The extended, high volume oil pump in conjunction with a larger capacity oil reservoir provides superior lubrication. 3. Accumulator has Larger Refrigerant Capacity The larger accumulator accommodates generous refrigerant amounts needed in longer line length installations. All settings are possible without the need for a computer connection. A special Energy Saving Mode is selectable by deep switch (available only in plug and play mode). The level of remote control input prohibition can be set when external management is by dry contact. 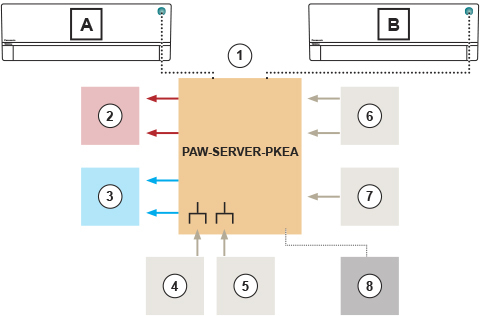 PAW-PACR3, in combination with one PAW-T10V on each indoor unit, allows the redundant operation of 2 (or 3) PAC-i or VRF indoor units. All units will be operated by programmable turns in order to achieve the same operating time (example turn every 8 hours with 24 hours). If the room temperature exceeds a freely set value, the 2nd (or 3rd) unit will be switched ON and an alarm will be activated. In combination with 1x PAW-T10V on each indoor unit, 2 or 3 PACi of ECOi can be programmed to run redundant.